Choose from our range of Cathay Pacific flight tickets from Hong Kong to worldwide destinations below. If you can't find the destination you're looking for, contact one of our friendly consultants on 2830 2899 or enquire online now. 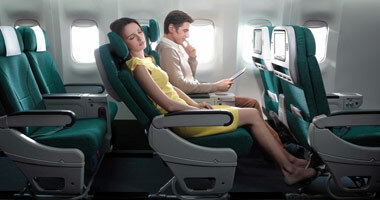 Find cheap Cathay Pacific airfares from Hong Kong now! Choose one of their popular destinations below or contact 2830 2899 today and ask about our great Cathay Pacific deals. Our all-in fares include taxes and fuel surcharges. Cabin baggage allowances vary for each class flown. Economy and premium economy classes each offer one bag up to 7kg in weight. The hand luggage allowance for business class is 1 piece up to 10kg. Always pack medication and valuables in hand luggage. Excess weight for any single bag may not exceed 32kg. Any item in excess of the free baggage allowance is subject to extra baggage charges. This includes sporting equipment, music instruments and pets. Ask your Flight Centre Travel Expert for specific rules on bulky baggage policies for the many different items that are accepted. Different weights and charges apply depending on your destination. Infants under the age of two who do not occupy a seat are allowed multiple pieces for check-in up to a maximum of 10kg. For routes to the Americas, infants are allowed one piece with standard weight restriction for an adult according to class flown. A small bag of food and nappies is allowed in the cabin along with a collapsible stroller. An approved car seat is allowed in the cabin only if a seat has been purchased for the child. Ask your Flight Centre Travel Expert for specific advice on items that are not allowed in luggage. Items such as flammable liquids, gases and materials, explosives, fireworks and other potentially harmful materials are never allowed in hand luggage or in checked luggage. Toiletry items and liquids taken in hand luggage must be in individual containers that do not exceed 100ml. 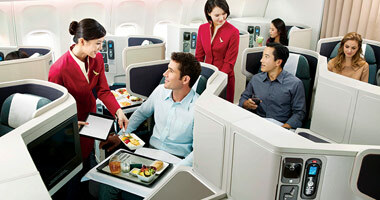 Cathay Pacific offers several check in options, from web and mobile check in to airport check in. Website and mobile check in is available from 48 to 2 hours before departure. Your reservation number is required for this type of check-in. Passengers choosing to check in at the airport counter should do so at least 90 minutes before departure. 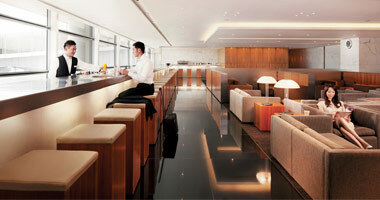 Cathay Pacific offers a myriad of lounge choices at its hub in Hong Kong as well as lounges around the world. Elite members of Cathay Pacific’s Marco Polo frequent flyer program are also allowed entry into over 550 lounges across the Oneworld alliance network with locations across the globe. Marco Polo frequent flyer members can earn points on Cathay Pacific, Dragonair and Oneworld alliance airlines. Benefits are determined by status level and include things such as extra baggage, check-in privileges and free upgrades. Status levels begin with entry level Green and continue with Silver and Gold and up to the highest tier of Diamond. More information about the Marco Polo Club program. 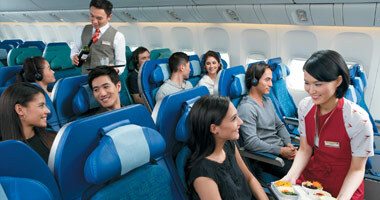 Cathay Pacific is a Hong Kong-based airline flying to 142 destinations spanning 39 countries and territories.